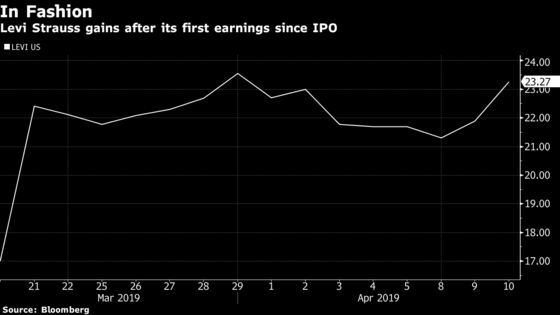 (Bloomberg) -- Levi Strauss & Co. gained as much as 8.1 percent Wednesday after its first earnings report as a public company showed revenue grew near the high end of the company’s expectations, helped by categories outside its main denim lines and growth in Asia. Shares climbed as high as $23.65 each as of 9:35 a.m. in New York, their highest price intraday since April 1. The stock has climbed 37 percent since its debut last month. Levi on Tuesday said revenue grew 7 percent compared with the year-ago period, helped by 28 percent growth in tops. Sales in the Americas rose 9 percent, while Asia rose 8 percent and Europe added 3 percent. Analysts have yet to start coverage or provide estimates for Levi, which re-entered the stock market in March. The investment community was unusually quiet on Tuesday’s earnings call, yielding no questions during the Q&A session and prompting laughs from the company executives on the call.